Over the last several months, there have been serious questions about a mental health facility in northern Colorado. JOHNSTOWN, Colo. — Over the last several months, there have been serious questions about a mental health facility in northern Colorado. In fact, a multitude of complaints has convinced state investigators to take a closer look at Clear View Behavioral Health in Johnstown. At the center of these investigations are two families. Both were looking to mental health professionals to help them through crises. Instead, they claim the facility and its staff only added to their problems. Mike is the father of 18-year-old Trevor. We’re withholding the family’s last name to protect their privacy. Trevor is a college student who at the time was having trouble sleeping and was stressing out over midterm exams. Trevor’s friends called his father with concerns about his mental health. So, Mike had Trevor checked out at Longmont United Hospital. And that’s when Mike says their nightmare began. Doctors at Longmont United referred Trevor to Clear View Behavioral on what’s called an “M-1,” a 72-hour mental health hold. “He was falsely held for insurance money,” Mike said about his son’s time at Clear View. Mike said when that 72-hour hold was up, Trevor had only met with a facility physician for a few short minutes. Yet the staff was telling the parents those doctors needed even more time to assess Trevor’s mental state. That meant they would likely be asking Trevor to sign a voluntary extension to the M-1 hold at a cost to the family and their insurance company of $1,000 per day. Mike insists there was nothing wrong with Trevor other than the stress of school and that Clear View knew it. “It's a for-profit hospital,” Mike said. “They had already started pinging insurance to see how much they could get paid." Trevor confirms that his meetings with doctors at Clear View lasted only a few short minutes. Not knowing the process, Trevor said he likely would have signed the M-1 extension. “I was there for 72 hours and they were going to keep me there longer,” Trevor recalled. It wasn’t until his parents were finally allowed to see him that he figured out how hard people were working to get him out. As soon as Mike figured out his son might be held longer, he hired an attorney to represent the family. And then he took his fight one step further. He stared recording his encounters with the hospital staff and management. In those cell phone recordings, you can hear a patient advocate telling Mike and his wife that Trevor may not be getting out after the 72-hour hold. She informs the family that the doctors need more time with Trevor and that Trevor can either sign the voluntary hold for another 72-hours or the doctor can issue what’s called a “certification hold”, something that could last weeks and will go on Trevor’s permanent record. Mike is convinced without bringing a lawyer into the mix, Trevor could have been there for weeks, even months. “Had I not caught on,” Mike told Contact7 Investigates, “he'd probably still be there." Mike said once the attorney informed Clear View the family’s insurance was not going to pay the $10,000-per-day bill, Trevor was released within hours. Less than a month after Trevor’s experience at Clear View, a second family reached out Contact7 Investigates. Brittney’s father-in-law Larry informed the family he was considering suicide. Once again, we are protecting the family’s privacy by only using their first names. Brittney said her father was severely depressed. And Larry, too, was issued an M-1 hold and referred to Clear View. Once that 72-hour hold was up, Larry was released. He claimed he was never assessed by a doctor at the facility. Within 24 hours of that release, Larry was again referred to Clear View after complaining of depression and suicidal thoughts. Brittney said help was the last thing her father-in-law got from the staff there. “He did not get it from them, not the first time and not the second time,” Brittney said. “All they did is add to his frustrations...and ask for money." Brittney said after demanding that her father be transferred to another facility, Clear View doctors issued a certification hold on Larry, meaning he was going to be there for perhaps weeks. Larry’s stay at Clear View was being funded by the taxpayers through Medicare. And Brittney said no sooner did Medicare inform the facility that it would not continue covering the bills that Larry was released. Brittney agreed to talk to Contact7 Investigates because she’s convinced many others have found themselves in the same situation at Clear View. “Something has to change, Brittney said. “The facility has to be held accountable." Accountable for what Brittney said was a serious failure at Clear View to help her father-in-law. Brittney also found several reviews posted on Google showing many others concerned and complaining about the care provided at Clear View. Those reviews were from patients and families claiming Clear View doesn’t care about patients — just the money. Contact7 Investigates also found similar online reviews from former patients claiming the facility was like being in jail. Even former employees chimed in, saying Clear View doesn’t care about patients or staff safety. Another former employee wrote, “The facility is a disgrace to the community and the profession of mental healthcare." Clear View responded to each review, generally saying their goal is to provide the highest quality behavioral healthcare to patients and families. Brittney has a different take. “They maybe do a great job of keeping people longer than they need to be there and of collecting insurance money," she said. Contact7 Investigates also spoke with a current and a former employee. Both declined to go on camera but both raised significant concerns about what they called “inadequate” patient care and short staffing issues contributing to dangerous working conditions. And they both encouraged state and federal investigators to look into possible insurance fraud. After multiple failed attempts to get a response form the management at Clear View Behavioral Health, we visited the Johnstown facility. We waited in the lobby hoping someone would meet with us and respond to the concerns raised by Mike, Trevor, Brittany, Larry and current and former employees. Instead we were asked to leave the property, the employee threatening to call police if we did not. No answers and no explanation for two Colorado families struggling to understand decisions made by mental health providers inside the building. Mike and Trevor want the state to close Clear View. Brittney and Larry are asking for and getting the state to investigate. In fact, Contact7 Investigates has confirmed investigators from two state agencies are now taking a closer look at Clear View's practices, something both Brittney and Mike insist was sped up after Contact7 Investigates got involved. A representative from the Attorney General's office met with Mike last week. 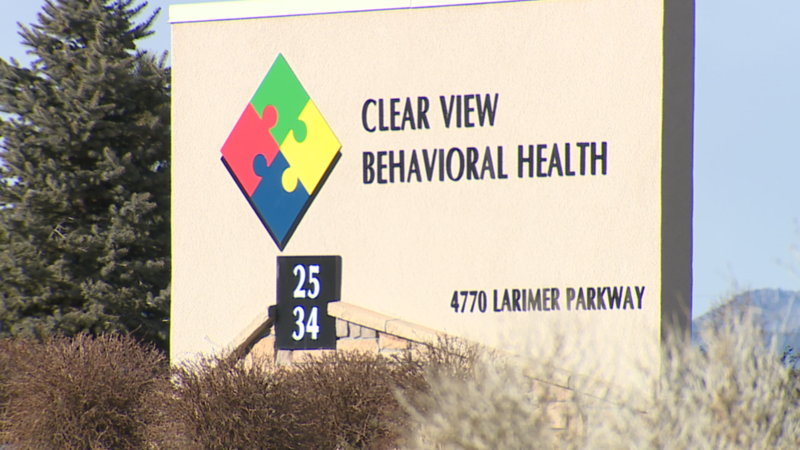 We also got this statement from the Colorado Department of Human Services: "The Office of Behavioral Health is currently investigating two complaints about the involuntary hold process and we have a site visit planned in the immediate future." Editor's Note: This story has been corrected to show that Mike and Trevor's insurance company would be charged $1,000 per day -- not $10,000.